Savory mix of�fruit�& gourmet items. Traditional Fruit and Gourmet Basket. This handsome basket is filled with fruits and gourmet food items. Fruit may include apples, grapes, and pineapple as available. Gourmet items include cheeses, crackers, sausages, candies, and similar items. Give the gift of sophistication, give a gourmet fruit basket. Exact basket and fruit/gourmet selection will vary by season and delivery location. Deluxe is shown. 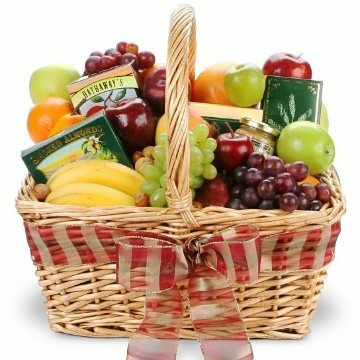 Traditional Fruit and Gourmet Basket has been purchased most frequently by our customers for the following occasions: Get Well, Sympathy, Christmas, Birthday, and Thank You.